Nationality: British. Born: Tunbridge Wells, Kent, England, 10 December 1886. Military Service: Boy soldier during the Boer War; served as Captain in Irish Fusiliers during World War I: Provost Marshal of Bagdad. Family: Married 1) Mary Lamont, 1919, son: the director Andrew McLagen, daughter: Sheila; 2) Suzanna Maria Brueggemann, 1943. Career: Prizefighter in Canada, and vaudeville and circus performer; 1920—film debut in The Call of the Road ; 1924—U.S. film debut in The Beloved Brute ; 1925—appeared in the first of many films of the director John Ford, The Fighting Heart . Awards: Best Actor Academy Award for The Informer , 1935. Died: 7 November 1959. Express to Hollywood , London, 1934. Johnston, A., "Victor McLaglen, Master of the Light Horse," in Women's Home Companion , November 1936. Obituary, in New York Times , 8 November 1959. Classic Images (Indiana, Pennsylvania), October 1983. Leibfred, Philip, "Victor McLaglen," in Films in Review (New York), April 1990. Gallagher, John Andrew, in Films in Review (New York), October 1990. There is something essentially mindless in the expressionistic style of acting; in it actors are just short of being automatons who express puppet-like the artistic vision of the auteur. In this respect, Victor McLaglen is the perfect lead for the two American filmic masterpieces in this style—John Ford's The Lost Patrol and The Informer . 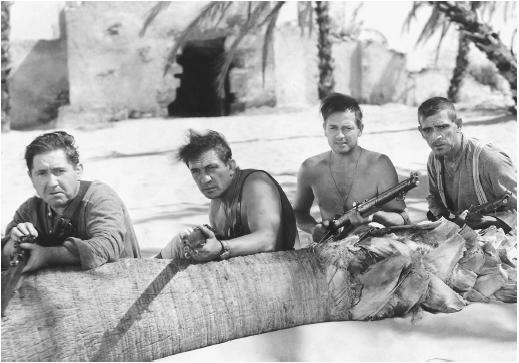 The frenetic vision of a group of soldiers lost in a patrol in the Mesopotamian desert finds central focus in the sergeant played by McLaglen. His exaggerated gestures seem appropriate when viewed against the otherworldly backdrop of sand dunes and tortuous palms. This realm of heat-induced hallucinations and even insanity provides an excuse for an actor whose body and voice function best at their extremes. One of the reasons that The Informer has fallen out of the high critical esteem in which it was once held is that its pervasive expressionism, above all in McLaglen's Academy-Award-winning performance, has been overborne by the movement to film outside the studio and the corresponding turn to a self-conscious, indeed intellectual approach inherent in the Stanislavsky method which, since the 1940s and 1950s has come to dominate English-language films. Given this change in style and given his acting strengths, McLaglen could only continue to flourish as the comic character actor—his oscillation between farce and sentimentality in the role of sergeant in John Ford's cavalry films such as Fort Apache , She Wore a Yellow Ribbon , and Rio Grande . This role was a continuation of that of the sergeant in Wee Willie Winkie in the 1930s—which was in many ways a parody of his role in The Lost Patrol . It may be a fulsome but not inappropriate analogy to compare McLaglen's sergeant in the cavalry films and his role of the overbearing squire in The Quiet Man to some of Shakespeare's clowns, if in no other way than their common exuberance and almost excessive sense of life. Outside of John Ford's realm—when McLaglen is playing neither the acharné role of the 1930s nor the ingratiating buffoon of the later films—he is nothing beyond mere histrionic grimaces and gestures. This fact is a tribute to Ford's choice of actor for his ensemble pieces—McLaglen's absence from the director's vision would be like a Franz Hals low-life canvas without its drunken, wide-mouthed clown.